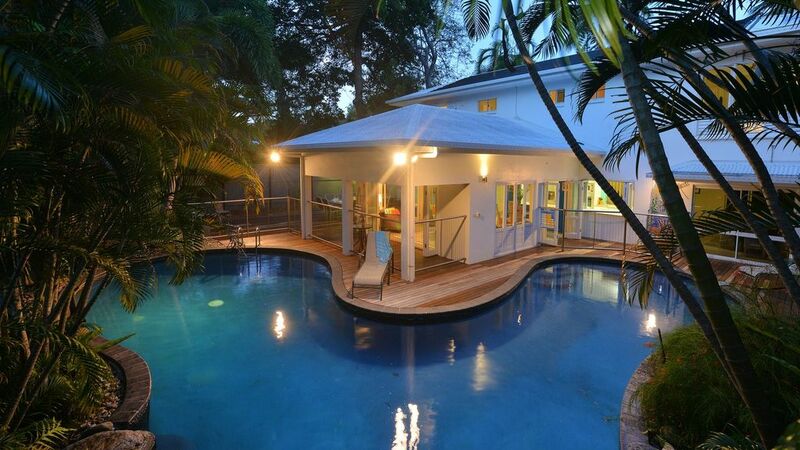 Casa Blanca - the Tropical House is one of Port Douglas' beautiful holiday houses. This peaceful setting provides the perfect base from which to enjoy everything Port Douglas has to offer. This two storey mansion sleeps up to 11 guests in comfort over 5 bedrooms. The property caters for everyone: large families, families and friends or up to 4 couples wishing to share a memorable holiday. Previous guests have called the property 'their own resort'. Positioned on a large 814sqm block, amidst a variety of mature rainforest trees, flowering shrubs and tropical palms, this grand family home has a commanding street presence. Designed around several open plan living areas, there is an incredible connection between the indoor and outdoor spaces. A sprawling timber deck flows between the rear living room, the alfresco dining and raised barbecue area, all linking to create a vast entertaining space. Views of the pool are seen from the kitchen. Four spacious, meticulously decorated bedrooms each with their own balcony are situated on the upper level overlooking the mature tropical gardens or the pool. A 5th bedroom is located on the garden level - an ideal kids room or teenagers retreat. The gourmet kitchen features elegant white cabinetry, European appliances and offers plenty of preparation and storage space for all of those aspiring chefs. The spacious free-form pool, 10 metres one arm and 10 metres the other, wraps around the house and is designed for year round pleasure. Sun decks surround the heated pool where you can relax on sun lounges. Located only moments from the idyllic, palm tree lined Four Mile Beach, this charming and sophisticated family home will undoubtedly tick all the boxes. On the garden level are two living areas, one flowing onto the extensive decking and pool.